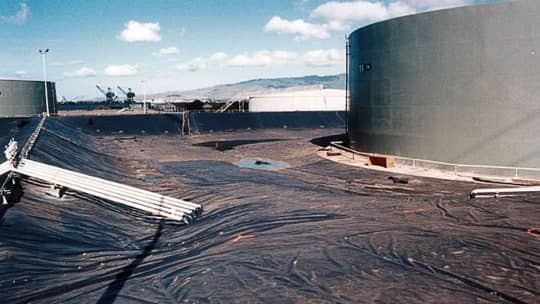 XR-5 was chosen as a more long term cost effective alternative to concrete, asphalt or unreinforced geomembranes to line the containment area around fuel storage tanks at Pearl Harbor. The U. S. Navy maintains one of the largest fuel storage facilities in the world at Pearl Harbor, Hawaii. This tank farm contains 16 tanks each over 200' in diameter. This bermed containment area was lined in the mid 90's with XR-5. The XR-5 was selected after the Pacific Division of The Naval Facilities Engineering Command conducted a Value Engineering Study and selected XR-5 as a more long term cost effective alternative to concrete, asphalt or unreinforced geomembranes. Over 1 million square feet of XR-5 is in service at this facility.